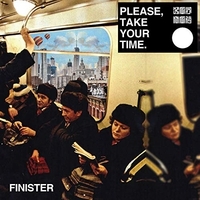 Florence’s FINISTER have put together a dynamic sophomore release in “Please, Take Your Time”. The breadth of moods is artfully expressed by the Italian quartet, as it weaves tapestries of psychedelic noise, energetic riffs, memorable vocal lines, and exposed sections of a hauntingly beautiful quality fans of AS TALL AS LIONS, PAIN OF SALVATION, and STEVEN WILSON will find familiar. One of the release’s most admirable features is the way each song unfolds organically, with each depicting a different emotional shade. So many albums in a variety of genres can become formulaic, or sound forced in trying to create variety; however, on this one, each song stands on its own without giving off a sense of contrived variance despite their contrasts. This is best illustrated in the successive tracks “I Know That I Can Be with You” and “Pan Tribal”. The first is a model psychedelic ballad with bluesy introspection preceding an excellent sax solo by Orlando Cialli that serves as a crescendo, culminating in an emotionally dissonant acceptance of reality before the final verse reestablishes the somber tone. The next track begins unapologetically in contrast, sustaining a primal rhythm throughout, with intermittent droning keyboards and wailing guitars making their presence felt. If a similar effect was aimed for on another band’s album there is a chance this stark difference could be perceived as an ill-prepared, attention-seeking display of “versatility”, but the two tracks bear a mysteriously appealing sense of continuity, as is consistently the case throughout. The song structures do not break uncharted ground, though they are executed and prepared in a highly effective manner. There is a sense of growth in each track, and one of the most effective techniques in achieving this is the thematic trading between instruments. For example, in “Skyscrapers”, the middle section builds with a bass line that loosely resembles the one found in the second reiteration of the verse, but this one drives on to add tension. Then, after a repeat of the refrain, the theme is reintroduced a few octaves higher on the keyboard, with the bass eventually joining in its original register to close out the album. Few things can escalate tension like a well-written pre-chorus, and “Vapor” features exactly that. The first pre-chorus presses forward in a floating figure found in the electric piano, driving the equally intensifying vocal line. In the second, this arpeggiated figure is inverted by the stronger guitar tone, thickening into a cloud. A more dissonant variation of this part is utilized in the same rhythmically informative way to propel the bridge, which ends in a clash between the dissonance in the guitar and the beautiful, airy vocal harmonies, evoking a sense of the cloud bursting into therapeutic rainfall. For the duration of the album, each musician does a consistently fantastic job, but the performances of guitarist and vocalist, Elia Rinaldi, and keyboards, sax, and background vocals juggler, Orlando Cialli are exceptional. The situational palpable emotions behind Rinaldi’s vocal attacks vary from the insidious hiss delivered in “I Can See You”, to the ebb and flow of existential angst in “Vapor”. Cialli’s parts find a balance blending into the texture in some sections and sticking out in others, such as his sax solos that are reminiscent of those found in PINK FLOYD’s “The Dark Side of the Moon”. On the keyboards, one of the best showcases of his ability to play a supporting role in the soundscape’s background, as well as driving a float into the foreground of the psychedelic parade can be found in “My Deepest Faces”. The neo-BEATLES-like track features many atmospheric brushstrokes, percolating synths, and a smooth lead theme used from the song’s midpoint onward. “Please, Take Your Time” is an impressive effort. FINISTER seem to be an ideal act for an eclectic music festival such as Roskilde or Bonnaroo, as their sound can appeal to a wide range of music enthusiasts. Each track has potential to connect with someone, no matter their musical preference. If one does not initially resonate with a listener, there are bound to be multiple tracks that will. Check out their video for “Lighter” below.